Remove Swirls & Scratches, Restore Clarity & Shine. 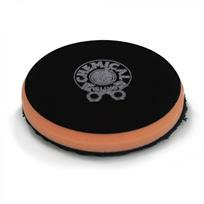 Black Optics pads combine high-quality foam with high-tech microfibre designed especially for Chemical Guys. The Orange Cutting Pad is designed to remove deep scratches and heavy oxidation from paintwork, quickly and easily restoring colour and clarity to damaged or neglected paintwork. For best results, refine paintwork using the Black Optics Microfibre Black Finishing Pad. Black Optics pads feature the latest construction technology. The Quadro-Bonding system uses a 4-stage lamination technique to create a strong bond between the hook & loop backing and the foam inner core, ensuring maximum durability. The pads themselves are constructed from Euro-Tech foam for even heat transfer across the surface of the pad and for maximum contact between the pad and the panel. This ensures a smoother polishing action and a high-quality finish. The foam pad is encased in extra thick microfiber with a layered cut to tackle random deep scratches (RDS), delivering great results, quickly.